A “Wildly Successful Farming: Sustainability and the New Agricultural Land Ethic” book discussion event with author Brian DeVore and farmer Bryan Simon. 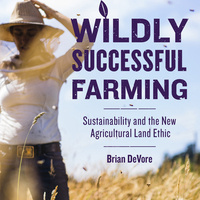 Brian DeVore of the Land Stewardship Project will discuss his new book, “Wildly Successful Farming: Sustainability and the New Agricultural Land Ethic” (https://badevore.com/wildly-successful-farming/ ). Wildly Successful Farming tells the stories of farmers in Minnesota and across the Midwest who are balancing profitability and food production with environmental sustainability and a passion for all things wild. They are using innovative techniques and strategies to develop their “wildly” successful farms as working ecosystems. DeVore will read from the book, sign copies and talk about what we can all do to support farming that integrates agriculture and ecology. Bryan Simon, a farmer and UMM alum who is featured in the book, will also be on-hand to share his story.